This weekend, the Society of Children's Book Writers & Illustrators (SCBWI) was hosting their summer conference in Los Angeles. So many talented writers were in town! 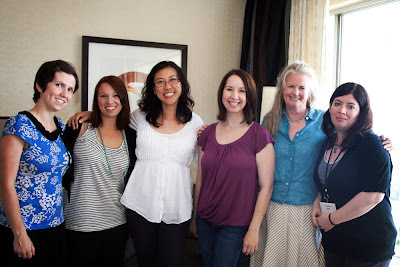 We were honored to get to sit down and chat with authors Cindy Pon (Silver Phoenix), Nova Ren Suma (Imaginary Girls), Suzanne Young (A Need So Beautiful), and Holly Goldberg Sloan (I'll Be There). All of these talented authors come from different backgrounds as writers and had such interesting stories to share with us. Come listen! Want to download this podcast? Click this link for a mp3! If you're in the LA area, don't forget to head over to Once Upon a Time in Montrose today. They are signing books there in... 45 minutes. Better start driving! Visit BridgetoBooks.org for details.